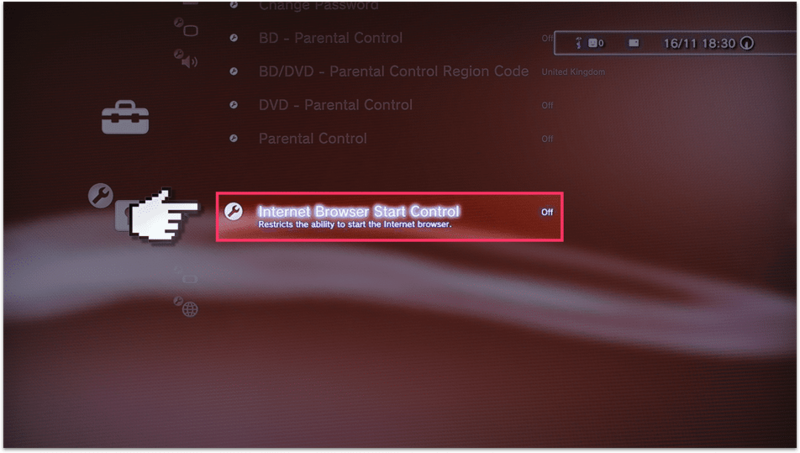 PlayStation 3’s parentals controls allow you to restrict the type of content your children can view based on maturity, the internet browser and chat with other users on the PlayStation Network. On the main menu go to the Settings menu and scroll down to Security Settings, press X to open them. Select Change Password – this will block any attempt to change these settings by the child in future. Enter a password that your children won’t be able to guess. The default password is 0000. Then, while still in the settings menu, scroll down to BD – Parental Control. When you open this you’ll be asked for the password you just created, so have that ready to go. Turn Blu Ray restrictions on, this will stop any Blu Ray being played that is too old for your child. Then, still in Settings, scroll down to BD/DVD – Parental Control Region Code, and you’ll be asked for your password again here. On that page select your country, that will then set the relevant age ratings for that country as the ones to be used. Still in Settings scroll down to DVD – Parental Control and open it. You’ll be able to choose the level of parental control for games, the lower the number the tighter the restriction. Check out the table below that shows what the levels equate to. Next scroll down to Internet Browser Start Control, on the next page you’re able to choose whether to disable the Internet browser. If you have parental controls set up elsewhere this browser can be a loophole that kids can use, so it’s best to turn it off. Lastly, scroll down to Parent Control and tap on that. You can then choose what level of parental control you want to set for games and other media. The levels don’t mean much by themselves so please take a look at the picture below showing what levels match up with approximate ages.